In our previous post we announced the brand-new Lagoon 40 that will be available from our main base in Split. One of the new Lagoons 450 F will be available also from Split. All other Lagoons will be located in our new base in Slano, but they all can be booked for one-way charters Slano - Split and vice-versa. After Captain Morgan that joined our fleet in 2018, a new Lagoon 50 named Twin Joy with stunning and unique visual identity, is coming for season 2019. Twin Joy is located in our charter base in Slano, from where you can easily reach beautiful islands such as Sipan, Lopud and even Bay of Kotor in Montenegro. Almost the same as Captain Morgan the large open cockpit of the Lagoon 50, Twin Joy, offers many spaces for relaxing and hanging out with your family or friends. Twin Joy features 4 double guest cabins with en-suite bathrooms, plus a fifth small cabin without a bathroom, that accommodates 2 kids or only one adult. It is, of course, fully air-conditioned. Two crew cabins in the bow are suitable for the skipper that is already included in the price and hostess or a cook, that are optional. Choose a cook or a hostess if you want to add more fun and relaxing to your sailing vacation in Croatia and less cooking and meal planning. The galley is equipped with all amenities; hob, oven, stainless steel sink, enough fridge and freezer space and even a dishwasher and an ice-maker. In terms of performance, with 2 Volvo Diesel engines of 80 HP each and larger water tanks of a total of 960 L (253 US gal), this Lagoon 50 makes sailing so easy. For even more fun on board, you have 2 SUPs! 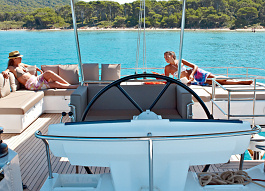 Feel free to check out our new Lagoon 50 and book your superb catamaran charter in Croatia. Elegance, comfort and functionality are the main keywords for the new Lagoon 450 F. The catamaran is located in our charter base in Split, from where the nearest islands of Hvar, Brac, Solta, Vis etc. are easily reachable. Relax fully and enjoy our splendid beaches and untouched nature. The two 57 HP Volvo Diesel engines and the generator are soundproofed in well centered lockers and located far from the four double cabins (with en-suite heads). All cabins are bathing in natural light and they are also fully air-conditioned. 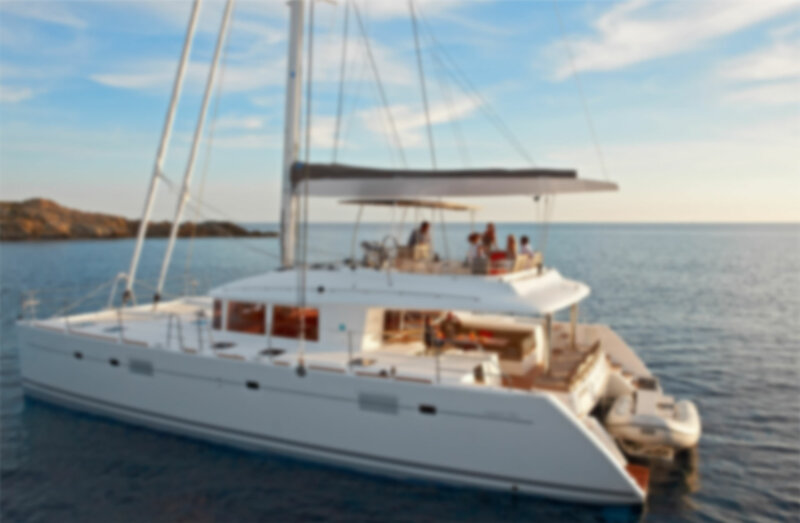 Apart from the standard Nava equipment package, this catamaran also has a dishwasher and an ice-maker. A SUP board takes you to exploring each bay and cove and upgrades your sailing adventure in Croatia. The boat is available as a bareboat but you should keep in mind that it weighs over 30 GT and requires a skipper with a Yacht master plus a co-skipper with some basic sailing certificate. Or, we'll be happy to find you a skipper. 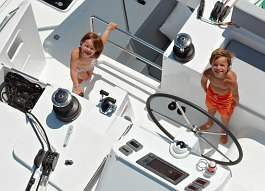 Sail Croatia aboard our new Lagoon 450 F and check availability and send us an inquiry. Another Lagoon 450 F, named Anja is also located in our charter base in Slano. Enjoy some of our Slano - Slano suggested routes or a one-way Slano - Split or vice-versa. In terms of accommodation, Lagoon 450 F has 4 double guest cabins with en-suite bathrooms and it is fully air-conditioned. Additional sleeping berth for 2 is available in the salon plus there are 2 small crew cabins in the bow. The "U"-shaped galley is equipped with fridges, a freezer, broad work spaces and plenty of storage. For even more fun with your family, there is a SUP board. 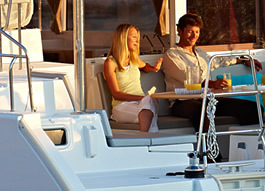 With 2 Volvo Diesel engine of 57 HP each the Lagoons 450 F has great performance on the sea. If you would like to experience sailing aboard Anja, send as an inquiry for more information. These new members of the Nautika Centar Nava family, are stylish and with strong personalities. 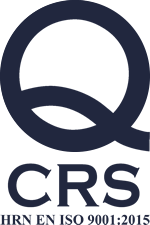 They are both located in our charter base in Slano. This new marina is just 12 Nm north of Dubrovnik, the pearl of the Adriatic and it's a perfect starting point for exploring South Dalmatia. The 2 aft guest cabins feature island double beds and en-suite bathrooms with a separate shower. The two forward cabins are a bit smaller and the en-suites don't feature separate showers. Very large windows offer excellent illumination of the cabins with magnificent view of the surroundings. With two Yanmar Diesel engine of 45 HP they are real masterpieces. 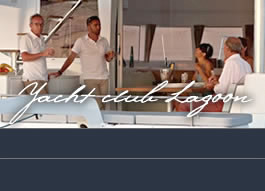 They are available for bareboat charter. 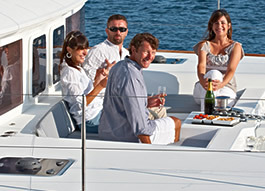 Get more information and book the fully air-conditioned Love Hunter on the boat's website. Finally, we have the other Lagoon 42, named Mala Kate II and she features cabins with fans and an air-conditioned salon plus a teak table in the cockpit. Learn more or book it by visiting Mala Kate II's info page.